1963 was a fabulously fruitful year for pop music, as girl groups wrestled for chart space with surf, vocal pop, R&B, soul, country, rockin' instrumentals and huge novelty hits. 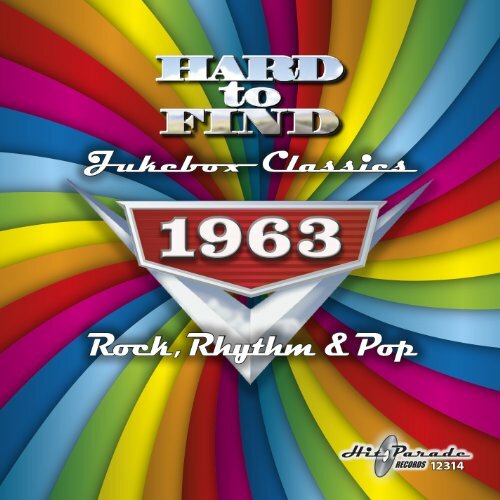 The HIT PARADE Hard to Find Jukebox Classics series now turns to this remarkable year in pop, and boy oh boy do we have some exciting collectibles from all these genres for you! The lead story: the worldwide stereo debut of the Surfaris' #2 smash Wipe Out. Wait 'til you hear those electrifying guitar riffs and long reverb trails spread out in stereo as the pounding drums plow full-steam ahead straight up the middle! That immortal moment in rock 'n' roll is track one, and track two is another sonic delight: the Phil Spector-produced Crystals classic Then He Kissed Me, also debuting in stereo. That's a real girl-group find, and so is this: Diane Ray's infectious Top 40 hit Please Don't Talk to the Lifeguard, a simply marvelous record whose double-tracked single version debuts right here in stereo! Next is the Tony Hatch-penned Forget Him, Bobby Rydell's last Top 10 hit, immediately followed by More, the instantly-recognizable Kai Winding theme from the movie Mondo Cane and one of four great instrumentals here. Those hunting for sublime '60s soul and R&B have much to rejoice about in this CD. Front and center are the stereo debut of Rufus Thomas's biggest hit, Walking the Dog, and the out-and-out deep soul classics The Love of My Man by Theola Kilgore and Cry Baby by Garnet Mimms & the Enchanters. On the pop-rock side, you get the rare stereo version of the Rocky Fellers' Killer Joe (never sounding better), and from the realm of pure pop comes the almost impossible to find Steve & Eydie Top 30 hit I Want to Stay Here, written by Goffin & King. As if that isn't already diverse enough, we remembered some great country crossover smashes from 1963 as well. You'll find Bobby Bare's highest-charting hit 500 Miles Away from Home and Johnny Tillotson's bright, bouncy take on Talk Back Trembling Lips, a classic rendition that soared well into the pop Top 10. And speaking of country: one of the most overlooked gems here is Gene Thomas's fabulous Baby's Gone, written by legends Roy Orbison and Bobby Goldsboro. This is a certifiable lost classic, a wonderful record that shoulda been a smash, making its CD debut here. Rounding out these 75 minutes are four classic hit novelties by the Ran-Dells (Martian Hop) and Lou Monte (Pepino, the Italian Mouse) plus Allan Sherman's smash ditty Hello Muddah, Hello Faddah! and the single-version debut at last (in stereo) of Ray Stevens' Ahab, the Arab. All but four of these 30 tracks (the most we could possibly fit onto one CD) were Top 40 hits. And please note: these are only the true, original hit versions - a guarantee you'll never get from download services like iTunes. We use only the best sources, EQ and the correct speeds - everything was carefully compared to the original vinyl singles. This is just like tuning into AM pop radio in '63, but without the static! The best audio engineers in the business worked many hours to bring these to you in the absolute highest fidelity (and, in several cases, in stereo for the first time). When you download an MP3 album, you get nothing like the complete song-by-song annotation and liner notes by Greg Adams that you'll find here. His histories and biographies will keep you engrossed for more than the full hour you'll spend listening to this treasure chest of tunes! 26 TOP 40 HITS! 30 TRACKS IN ALL (17 IN STEREO)! 75 MINUTES OF MUSIC IN UNEQUALED SOUND QUALITY!